We hike in 9 miles to the lake. By now the trail is familiar for this year–logout started in May so we’ve done a couple day trips to get to the five mile point. Then we got a report that there were only four more logs before the lake, and that a volunteer cut them. So our hike today is mostly a commute, a long walk. The climb over Cone Mountain marks five miles, and is one of the worst parts of the trail. Katie the packer has asked us to see what we can do about a rocky narrow trench in a boulder patch. We get to the spot. Seems like filling it in is the thing to do. We drop our packs by the side of the trail and look around for breadloaf-sized rocks to pile in the bottom of the hole. We are in the direct sun and lush vegetation hangs over the sides of the trail. Seeps of water from the hillside trickle into the trench. It’s as if every pore in my body has opened. Just one of those middle-aged woman wacky temperature regulation moments? No. I look over at Sam. She could be my daughter. Beads of sweat have popped out on her tan forehead and she has a look of mild distress on her face. Wow. It’s really hot. We’ve brought along collapsible buckets and ferry loads of gravel from deposits that have washed down to low spots in the trail. Bucket by bucket, we fill in around the larger rocks, imagining horse hooves going over this place. At last it’s good enough and we put our pack on to keep moving into shade. Heat is an energy drain. The heart works harder to pump blood around the body, sending it to the surface to cool. That surface is sweaty, the body’s attempt to discharge the excess heat. Air movement across damp skin does cause cooling. The fluids exuded as sweat must be replaced. There is a powerful need to drink water. Thirst. Nine miles to camp, and I have drunk 7 liters of water. Once I am thirsty, I am running on a deficit that can take days to replace. 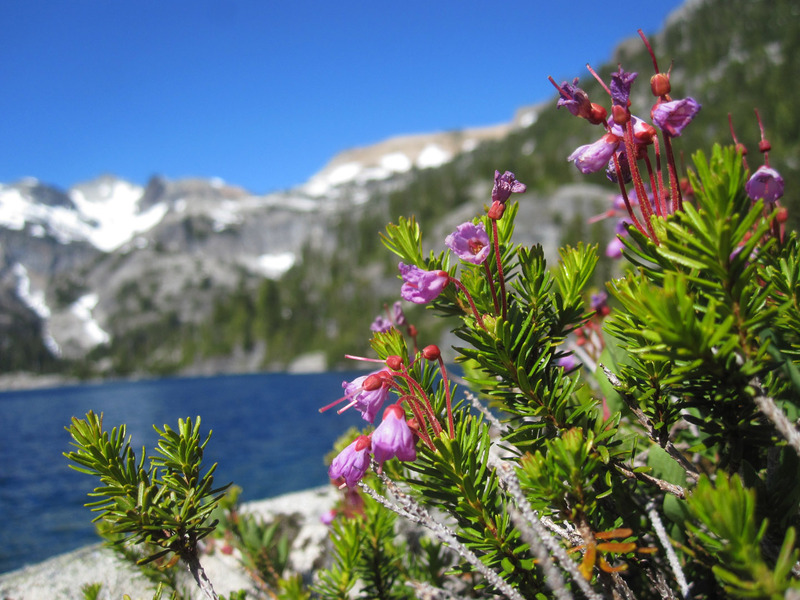 With five of us, we plan for an ambitious day–push up the Pacific Crest Trail (PCT) toward Deep Lake. Brent offers to scout ahead and has a report by 11 o’clock. There are nine logs, all small. Jon decides that he and Angela can take the crosscut saw over to the Waptus Pass trail, where there are bigger more complex logs. While Brent and Sam finish the logout with large pruning saws and a double bit ax, I get going on the brushing. The PCT climbs up the Spinola Creek valley, crossing several avalanche chutes. The snow slides are frequent enough to prevent conifers from being established. Instead, a variety of vegetation flourishes in the openings. Bracken ferns sway overhead. A mixture of thimbleberry, huckleberry and salmonberry obscures the trail tread. You can’t see where to place your feet. I’ve got a brush whip, a sharp serrated blade on an arch at the end of a wooden handle. By swinging this through the stems, centrifugal force lops the soft-stemmed plants. We all love to do this job–the results are immediate and gratifying. After throwing armloads of wilted ferns off the trail, you can look back to see a neat swath through the green. By the time Brent and Sam return, I have done 500 feet. Working together, we are far more efficient. We take turns with the whip, while the non-whippers fling piles of brush away and follow with pruning saws to cut woody stems and any stragglers. When it’s time to head back to camp, we’ve cleared 1200 feet and gotten the worst of it. Good job, crew! Feels like we did some good out here today. Topic of the Day: Microtrash? Cloudy, cooler. The trail crew packs up to hike out. I’m staying for four more days. I’ll spend the day patrolling campsites along the lakeshore. A wilderness ranger is similar a backcountry motel maid–after people spend the night and leave in the morning, the ranger/maid goes in to clean up. Instead of making beds, I observe two elements of Leave No Trace outdoor ethics: Minimize Campfire Impacts and Dispose of Waste. I’ve noticed that people who drink instant hot cocoa in the backcountry are prone to throwing the wrappers into the fire. These are lined with foil, which does not burn. I hunch over the ashes picking out little wads of silver with gloved fingers. This is what John calls the “Hot Chocolate Wrapper Nightmare”. I find other bits of trash as well. A sliver of mylar energy bar wrapper, twisted bits of nylon string, a wisp of tissue paper. Microtrash. 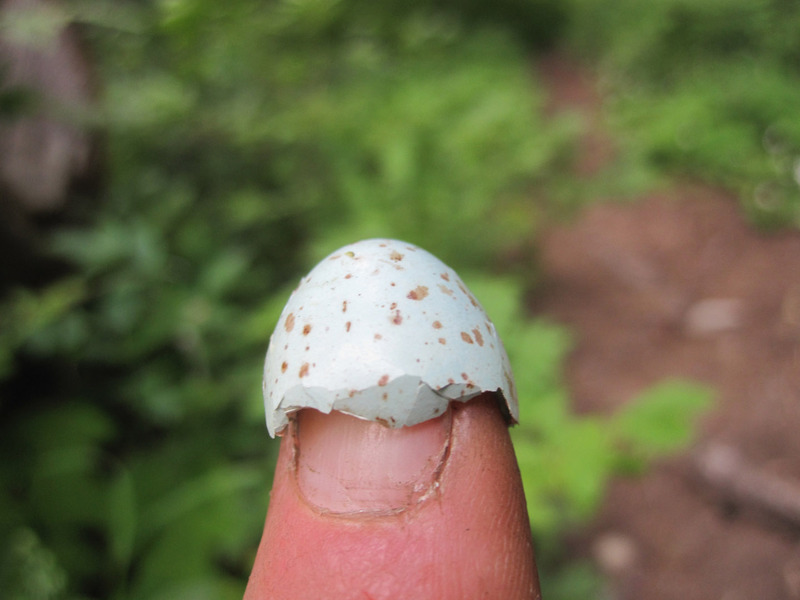 Discarded from the nest, half an eggshell as big as the end of my index finger lies on the ground. I found one with a tiny piercing, a hole from the egg tooth of an embryo.As the shell parted and fell away, the embryo too its first breath and became a hatchling. A baby bird. I’ve brought the brush whip, and clear 600 feet in a place we call the Snag Patch. The thimbleberry is prolific. I see no one all day. Spade Lake trail. I’ve worked on it but never climbed all the way to the lake. 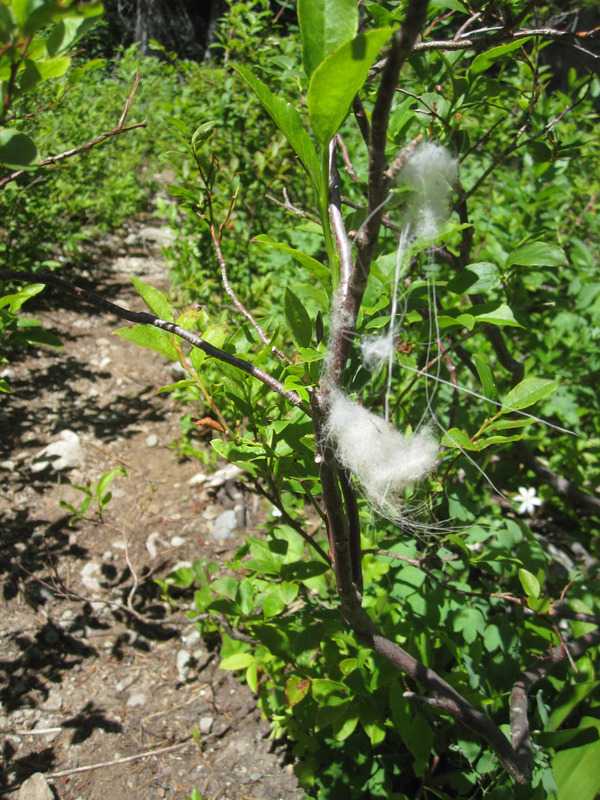 This trail is infrequently maintained and is suitable only for hikers. It ascends 2000 feet in 3.4 miles. Strenuous. Adventurous. Sweaty. Sometimes you have to stop and smell the heather. Take your boots off and soak them in the lake. Bask on a rock. Filter some water and drink. But only after removing foil from the remains of an illegal campfire (fires prohibited above 5000 feet to protect the subalpine ecosystem). Totally worth it. 9.6 miles for the day, and two hours late back to camp. Thinking about where I was three years ago, four years ago. Caught up in a medical adventure, not knowing if I would ever make it to Waptus Lake under my own power again. Scary and depressing. 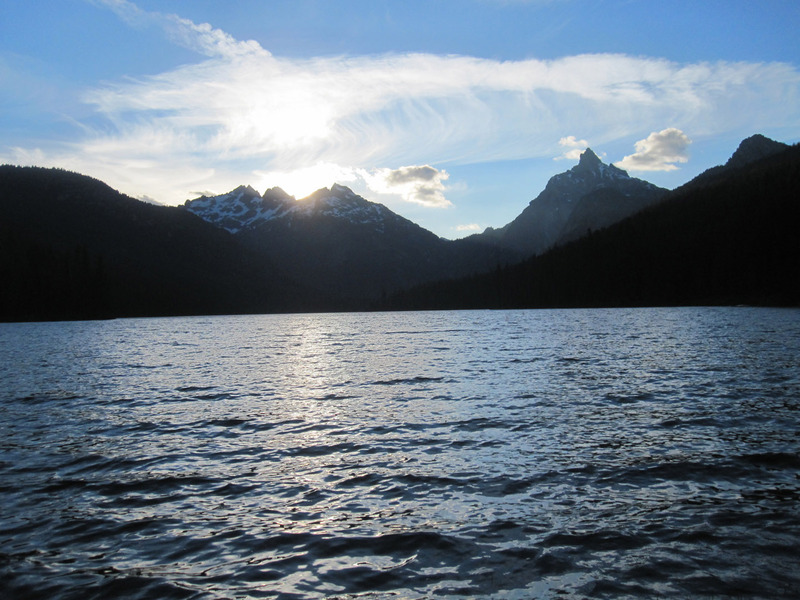 As I recovered from heart failure, Waptus was my first backcountry trip. Wanted to see if I could do it. Wanted to heal. I did heal. Even now, sometimes I am so damn grateful to be upright and breathing doing what I do, loving what I love. I’m lucky. The gratitude bowls me over, leaves me speechless. What about you? Where do you feel most alive? And grateful? Morning light penetrates my eyelids. My tongue feels swollen and stuck to the roof of my mouth. I crawl out of the tent, heat water for tea. Pick my way over the cobbles to Spinola Creek and splash cold water on my face. My eyes still feel gummy. I put on my boots and pack then head out to check a nearby campsite to test my energy level. My skin is slick with sweat, my head feels the first throbbing of an ache, my bowels cramp. A grown-up voice in my head advises that today is not the day to climb up to Lake Vicente. This is heat exhaustion and the best thing I can do is go back to camp to rest and rehydrate. The human body is a living organism. Cells are bound together into functioning tissues and organs, animated by a mysterious spark of energy. The body has its own intelligence. Our culture has taught us to separate the mind and body, and we are accustomed to operating out of our heads. Often we have the (mistaken) assumption that we can overpower the body by sheer force of will. Just ignore the hormones and neurotransmitters that the body uses to communicate and get on with whatever we want to do. How many times have I paid the price for pushing the body further than it wants to go? I know I can endure, but I want to be more discerning about when it’s truly necessary. Spending a few days in the backcountry living out of a pack brings me closer to my organism. I have fewer resources to cope with extreme situations, and help is hours away if I do something foolish. So I stay in camp and tend to the body, which thirstily drinks water, savors salty pepperoni and cheese for lunch, and drifts off into a light nap during the hottest part of the day. My camp reading is Redbreast by Jo Nesbo, a Norwegian cop thriller that I picked up at the Roslyn Library book sale. I finished it and went to bed early. Got up once in the night and put my glasses on to stargaze. There was no moon, a star-prickled sky, and one long glistening meteorite. Feeling much better today. It’s go-home day, and I pack up with the fond wistfulness I always feel when it’s time to leave Waptus. On the one hand, I look forward to being home to clean myself up and loaf around, eat nectarines and salad, and see my animals and garden. On the other hand, I know that I will emerge from the wilderness with finely-tuned senses. Merging myself back into society, witnessing the behavior of other humans and interacting with them can be a shock. Remind myself that I’ve done this many times before, and it’s different every time. The miles unfurl beneath my boots. My pack squeaks softly with each step. One leg in front of the other. Mosquitoes chase me from Trail Creek over Cone Mountain, then thankfully disappear as I make my way downriver. After six days, the earworms have died. I stop for lunch at a campsite, and find a fire ring to dismantle. Also a sweet swimming hole–a slab of rock that gradually slips into the river where the current is slow and the pool is deep. The water is so clear that I can see the details of the gravel at the bottom. The shallow water takes on a golden cast and turns to aqua blue out in the current. It’s sooo tempting…I filter drinking water and keep going. The air is still and hot and I can feel myself zombie hiking. My feet are on autopilot and my mind is a million miles away. I bring myself back to listen to the chuh-durp of a tanager in the treetops. It sounds as hot and lethargic as I feel. I meet hikers at Hour Creek. They are on their way in. I meet another pair of hikers near the wilderness boundary. Only a mile to the truck now. The birds are silent except for the occasional tseep-tseep of ruby-crowned kinglets deep in the brush. As I approach the Polallie Trail junction, I hear screaming. It’s human. I remember my mom talking about listening to my sibs and I when we played outside as small children. She said there was happy screaming just for the fun of making noise, and then there was scared hurt screaming. What I hear is happy screaming. The trail brings me next to the Cooper River, where there is a big pool below the trail. Two large women in bathing suits are standing knee-deep in the water. One of them holds a chihuahua in her arms. The women are encouraging two others perched up on a rock bluff to jump. All I need to know is that no one is in trouble. I reach the truck and open it. Hot air puffs out at me, stale from being closed up. I’ve stashed a canvas bag with sandals and a dry shirt. As I make my way to the toilet to change my shirt, a guy comes out. He is so drunk that his eyes are unfocused. He has missed the hole and peed all over the concrete floor. Someone has left a bag of garbage in there. I come out and the drunk guy asks me how to get down to the river. My explanation sounds incoherent even to me. I can’t wait to escape. The dry shirt feels good next to my skin as I drive back to town. There’s traffic. Houses. People. The ranger station. I park, and drag my pack out. Throw away the garbage that I have carried out from Waptus and the toilet. The office is utter air-conditioned chaos. I fill my water bottle and carry my paperwork out the the picnic table by the fire warehouse. There’s a sense of urgency about downloading my notes into various reports before I hit the wall of fatigue that looms about three feet from my head. The trail crew comes by and we share stories and laugh before it’s time to go home. The day after returning from a trip is rest and rehab time. I allow myself to float in that in-between state of not quite feeling all the way back. It takes awhile to make the transition. I am grateful to have driven safely over four days to the woods and lakes of northern Wisconsin, traveling through mountain ranges and deserts and through the Badlands, all beautiful and amazing country. And here I am, back for the 25th year, on Long Lake with my in-laws, enjoying their presence and listening to the loons call in the night. I love these journals! You take me there when I can’t get away. I send them on to friends and family. Please know that you are heard! We love the way you write, and what you write about…. Thanks for coming along on my trips, Lori! I’m glad to have you along.